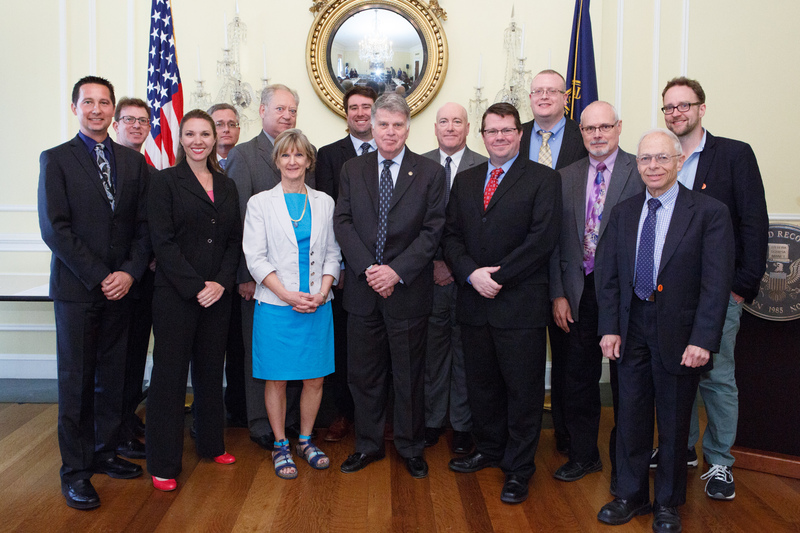 Group shot of the Advisory Committee first-term members, April 19, 2016. The FOIA Advisory Committee’s second term gets underway this morning at the National Archives and Records Administration. The first term’s most notable deliverable was its vote to update outdated Office of Management and Budget fee guidance – written before the internet and missing a key word. A recent blog from the Archivist of the United States notes that for its second term the Committee – at the direction of the White House – will “look broadly at the challenges that agency FOIA programs will face in light of an ever-increasing volume of electronic records, and chart a course for how FOIA should operate in the future.” This directive gives the Committee a springboard for addressing some of the thorniest real-world FOIA issues agencies face, and an opportunity to provide concrete, actionable steps agencies can take to improve their FOIA shops. The Justice Department has issued new guidance on agency response letters resulting from improvements codified by the FOIA Improvement Act. The guidance highlights that when issuing adverse determinations, agencies must provide requesters no less than 90 days to respond. It also emphasizes that agencies must advertise the availability of both FOIA Public Liaisons and the Office of Government Information Services as requester resources, including when an agency’s “unusual circumstance” will delay the processing of a FOIA request. The guidance fails, however, to remind agencies that “unusual circumstance” delays are not delays that result “from a predictable agency workload of requests, ” or that agencies cannot charge most FOIA fees if they do not meet the processing time limits (before the FOIA Improvement Act’s passage, agencies claimed they could still charge fees for late requests by deeming them “unusual”). The American Society of Access Professionals held its National Training Conference this week in Arlington, VA. Expert panelists included the National Security Archive’s Nate Jones and Dr. Robert Wampler, MuckRock founder Michael Morisy, USAToday’s Brad Heath, FOIA litigators Mark Zaid and Scott Hodes, and FOIA specialists from across the federal government. In his keynote address, Judge Royce Lamberth hailed FOIA processors as the heroes of government accountability, a mentality that should be cultivated and reinforced. The conference was a good reminder of 1) the importance of professional, two-way dialogues between requesters and FOIA processors, and 2) that FOIA processors are negatively affected by bad agency decisions – from outdated FOIA processing software to antagonistic agency cultures – in many of the same ways requesters are (Mark Zaid pointed out that many problems heaped on the FOIA office come from managerial/non-FOIA staff). 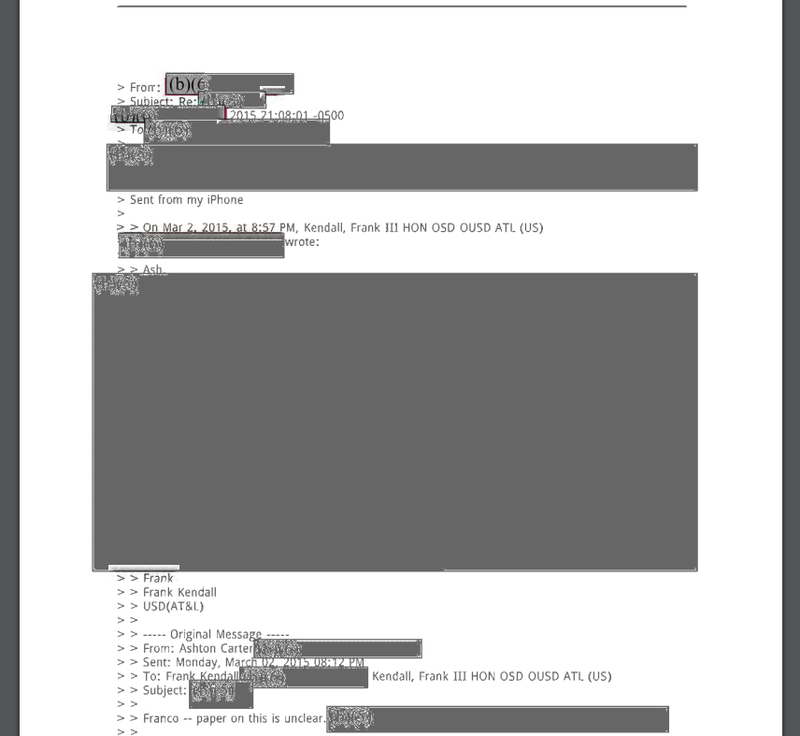 Heavily-redacted emails sent from Secretary Carter’s personal email. The New York Times is suing the Defense Department under the FOIA “to force the Pentagon to release full copies of more than a thousand pages of work-related emails Defense Secretary Ash Carter sent and received from his personal account.” Last December Carter acknowledged that he used personal email for government business for the “first few months” of his tenure as Defense Secretary, which began in February 2015. News that Secretary of State Clinton used a personal email address broke in March 2015, meaning Carter continued relying on personal email to conduct government business while Clinton was under intense scrutiny for doing so while Secretary of State. The Defense Department responded to the Times’ initial lawsuit by releasing 1,300 heavily-redacted emails sent from Carter’s personal account; Pentagon spokesman Gordon Trowbridge maintains that “there was no classified material in Carter’s personal emails.” After Campaign for Accountability called for the DOD’s Inspector General to investigate, the IG sent a response letter saying that it would not investigate — only to later retract and say the letter was sent in error and no final decision had been made. David Medine, former PCLOB chair. The release of the “28 pages” does not mean that no other documents related to 9/11 are being senselessly withheld. Former Senator Bob Graham, who has long fought for the pages’ release, notes that the FBI continues to conceal important aspects of its investigation in Florida. The DOD is withholding nearly 60 pages of Donald Rumsfeld’s documents on Osama bin Laden, Al Qaeda, and the Taliban from 2001 — including the nine months preceding the attack, leaving it unclear what Rumsfeld’s office did or did not know in the lead-up to the tragedy. (The Archive requested the records a decade ago, and only recently received the heavily redacted response; all withholdings were pursuant to the national security exemption and FOIA’s “withhold it because you want to” exemption 5.) The 9/11 Commission’s interviews with Presidents Bush and Clinton are also still secret, as are interviews with Vice President Cheney. “Even though the government denied at least part of more than 345,000 requests [in FY 2015], it only received 14,639 administrative appeals.” This statistic is part of the reason why MuckRock is launching a database of FOIA exemptions – what founder Michael Morisy hopes will be a “Google for FOIA rejections” that will help requesters understand why their request was denied, and how they can fight it. Morisy says that the goal is to chart how individual exemptions are used, and the real-world negative impacts of the exemption. MuckRock hopes to launch the database by the end of the year. Managing editor at the New York Times, Sergio Florez, filed FOIA requests with both the CIA and the FBI on his father, Cuban diplomat and eventual defector, Dr. Armando J. Florez. The CIA issued a Glomar denial, prompting the younger Florez to appeal, and eventually sue. The district court upheld the CIA’s Glomar denial. While Florez appealed the ruling, the FBI released documents in response to Florez’s request, prompting the Second Circuit to remand the case back to the lower court; the Second Circuit found “that the FBI disclosures are relevant to the issues raised in this appeal and that those documents should be considered in this case.” In her dissent, however, Judge Debra Ann Livingston argued that the FBI documents “disclose little regarding Dr. Florez and say nothing at all about any connection to the CIA” and “are simply not helpful in assessing the logic and plausibility” of the CIA’s Glomar. 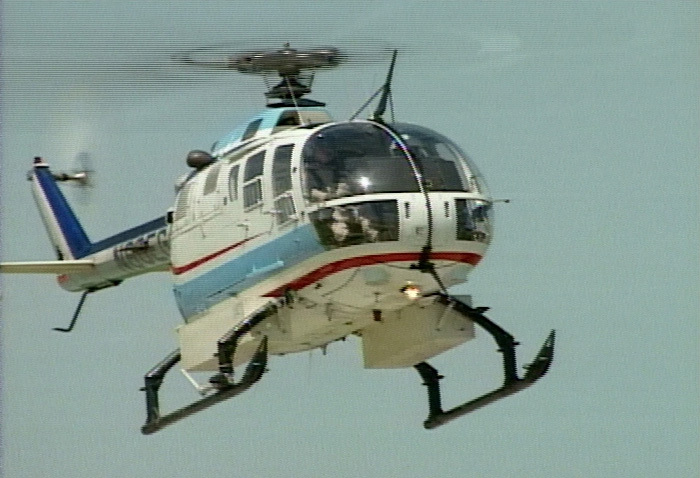 NEST helicopter with radiation detection equipment. Courtesy of Robert Windrem. This week’s #tbt pick is the 2012 posting, “Nuclear Terrorism: How Big a Threat?” The posting contains 40 declassified documents from US and other government agencies concerning assorted aspects of the current US nuclear counterterrorism effort.